Three words – optic nerve glioma – don’t exactly roll off your tongue but it’s a condition Tamara Tedesco has lived with since infancy. Vancouver-born Tedesco was diagnosed with the condition at 18 months when her parents received what she calls a quick “spot-on” diagnosis. Optic nerve glioma is an uncommon condition involving tumours that press on the optic nerve, causing blindness. In Tedesco’s case, there is a benign tumour on the optic nerve of each eye. She underwent 18 months of chemotherapy to shrink the tumours, an experience she “sailed through,” considering the trauma of both the disability and the treatment. As often occurs with childhood illness, Tedesco thought her condition was just part of life because it was all she knew. “Being so young, I thought my reality was normal and that every kid had to do the things I did.” In one instance, her lack of sight proved a blessing. “When my hair started falling out, I couldn’t see that other peoples’ hair wasn’t falling out, too,” she said. Tedesco now has roughly eight per cent vision in her right eye and light perception in her left. Her peripheral vision is completely gone, resulting in tunnel vision. Tedesco uses the word “lucky” to describe the fact that her condition is stable. She undergoes an MRI every two years, each of which has shown that the tumours are shrinking slightly. Tedesco attended the British Columbia Institute of Technology (BCIT), graduating with a certificate in marketing and communications in 2010. She currently works as a communications coordinator, handling public relations, media relations and community outreach for the British Columbia and Yukon office of CNIB in Vancouver. “This is exactly what I wanted to do. I really enjoy the fact that the work is different every day,” Tedesco remarked. Her future career plans include continuing to work in areas where her excellent communication skills can be put to use. “I can really get behind the idea of increasing independence for people who are blind or partially sighted”. The hallmark of Tedesco’s life is her ability to advocate for herself – to look honestly at her needs and seek assistance when necessary. Now, she hopes to help others do the same. “By the time I reached post-secondary school I really knew how to advocate for myself. I took my laptop to class and asked the teachers for assistance. Whatever accommodations I requested were granted”. 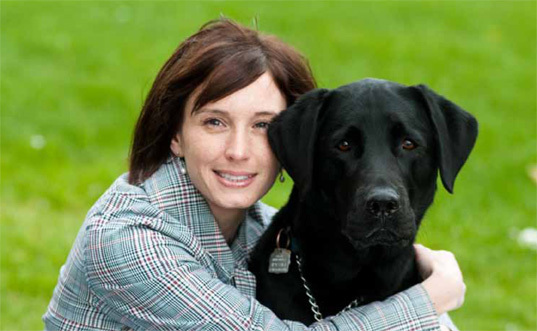 As part of her commitment to defend the rights of the disabled and advocate on their behalf, Tedesco is a member of the board of directors of B.C.’s Access for Sight Impaired Consumers (ASIC), an independent, consumer-driven advocacy coalition addressing issues affecting people who are blind, sight impaired or deaf-blind.